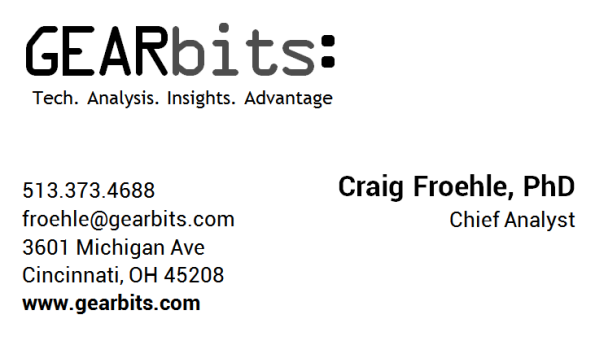 GEARbits provides technology and industry analysis and assessment to clients around the world. Founded in 2003 by Dr. Craig Froehle, we strive to provide standardized and on-demand reports for a variety of organizations and individuals, including investors, foundations, technology news outlets, and industry members. Let us know how we can help you better understand the dynamic world of technology. Copyright (c) 2017 Craig Froehle. All Rights Reserved. Simple theme. Powered by Blogger.